Chloe Hart (left) and Rital Neyaz (center), both 11 years old, became fast friends at the camp. 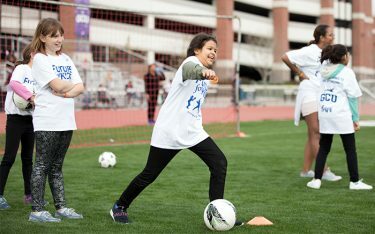 Eleven-year-old Rital Neyaz’s favorite part of the Future For KIDS Soccer Camp this weekend at Grand Canyon University — she’s fairly certain of it: when the soccer players teaching the camp actually encouraged her to aim a soccer ball right at them. Right at them, she said, with kid-glee sparkle in her eye. Rital and Chloe were thick as thieves even though they just met that morning. That kind of bonding and sheer kid joy was what coach Schellas Hyndman was looking for at the camp. 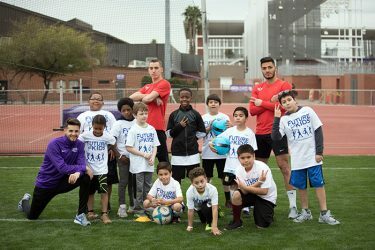 It was the first time the GCU men’s soccer team hosted an activity like this for Future for KIDS. Be kids, he said. Have fun. But Hyndman also wanted to plant a seed. 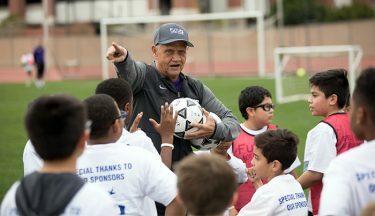 Men’s soccer coach Schellas Hyndman wanted one thing for the youth at Saturday’s Future for KIDS soccer camp: Have fun. But he also spoke about good sportsmanship, working hard and the value of getting an education. While few at this age are even thinking about college, he challenged them to look at the soccer team players who were helming the half-dozen stations, where campers learned everything from passing to shooting and dribbling. 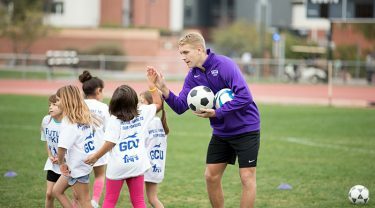 “As they (GCU men’s soccer players) got older, they started enjoying soccer. They thought, ‘Maybe I can go to college. Maybe I can get a soccer scholarship or maybe I can get an academic scholarship.’ That education that you get opens the door for you the rest of your life. Without that education, your opportunities are closed. But with an education, you can dream big. Helping children open those doors is the calling of Tempe-based Future for KIDS. 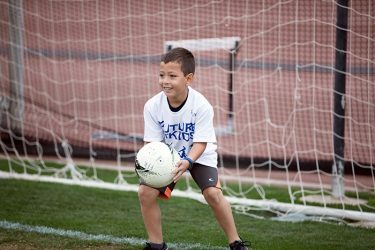 The nonprofit invests in children through camps — such as Saturday’s free-admission soccer camp at GCU. But it also offers mentor-driven programs outside school hours. Future for KIDS trains and places mentors, including several Lopes who volunteer for the organization. The nonprofit emphasizes academics, athletics and ethics to improve the lives of youth who face adversity. “I was talking to Coach (Hyndman) about that — academics, athletics, ethics — and that’s very important to him, too,” said Madonna Bistany, Future for KIDS Executive Director. She emphasized how GCU’s goals very much align with Future for KIDS goals to build up the community. Defender Julien Armaroli (right) helped out campers with more than just soccer skills. 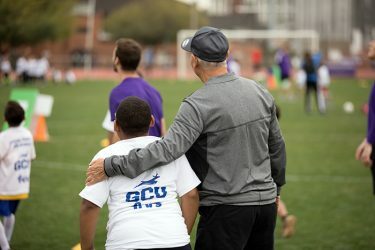 Future for KIDS touts a history with GCU, having partnered with the men’s basketball team for a similar mentor-driven camp a few years ago. Campers moved through six stations, learning everything from dribbling to shooting, passing and goalkeeping. Zoyla Nava of Phoenix, whose 9- and 10-year-old sons, Eric and Israel, zigged and zagged on the practice field, feels a strong sense of community through Future for KIDS. Her daughter participated in the nonprofit’s programs, and now her two sons have joined the fun. Their school, Ignacio Conchos Elementary in south Phoenix, offers Future for KIDS programs after school on Tuesdays. Participants create arts and crafts, are educated in an anti-bullying program, and learn how to be social. 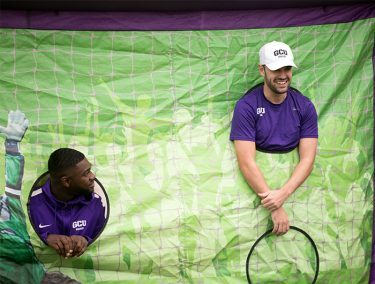 Campers took aim at some of the GCU players, who were willing targets, including forward Calvin Kissi (left) and freshman forward Bert Wilton. Fran Meador of Phoenix heard about the soccer camp through the I.G. Homes Branch of the Boys and Girls Club and signed up her son, 11-year-old Darwin. He loves soccer, she said. It isn’t the first time GCU has been a part of her family. Her daughter, a senior at Alhambra High School, has received academic help at GCU’s Learning Lounge. Margit Tirpak broke out in a big smile on the track surrounding the practice field as she watched her grandson, 7-year-old Logan Cox, line up for soccer exercises, his long yellow socks in tow. Freshman Mitch Stevens gave plenty of encouragement and high-fives. “It gives them a whole other dimension of the sport in working with actual athletes that are doing this,” she said. Hyndman said camps like these wouldn’t be possible without the willingness of his players. Men’s soccer team goalkeeper Michael Haynes, a freshman sports management major, said the players tried to put themselves in the mindset of the campers and, in the end, they just wanted to have fun. “The thing I’ve enjoyed most about this event is to just interact with the kids and teach them simple fundamentals of the game — and just being able to see them happy,” he said. 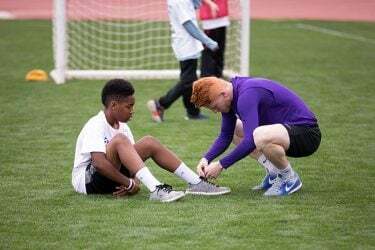 GCU men’s soccer player Ariel Aguas, a sophomore finance major and recent transfer from Phoenix College, taught campers about looking for openings on the field and finding a way to maneuver through those openings. Future for KIDS campers and GCU players took time out for a group photo. Tirpak loved that the camp was on a college campus. “It’s great for everybody to see this can be your future. Nothing can hold you back if you do some hard work,” she said, echoing Hyndman’s talk about putting in the hours, working toward academic or sports scholarships and assuring they get a good education: “The way that you win more than you lose is to work at it,” he said, much like his soccer players. Hyndman left the campers with a little encouragement he hoped they would take with them long after Chloe Hart, Rital Neyaz and the others aimed their last soccer ball at GCU’s soccer players. He hoped they would aim for something more. Great work! So glad to see such involvement from young adults giving their time and energy back to kids in their community. Hats off to GCU for such a great program.